If you’re looking for a simple cheesecake ice cream recipe, this one is perfect! It has only six ingredients, plus it’s a recipe for homemade ice cream without eggs which makes it even easier. You can add whatever toppings you like to this homemade ice cream recipe, but chocolate chip cookie cheesecake ice cream is hard to beat! About six or seven years ago, I bought myself an ice cream maker. Ice cream is my #1 favorite dessert (tied with chocolate chip cookies for that top spot) and being able to make homemade ice cream ? And you’d think in Arizona, where it’s 1000000 degrees outside, making homemade ice cream would be a consistent part of our summer. But there was one stumbling block. And that was our freezer. Our kitchen is not particularly large and it also seems to have been designed by someone who had never actually used a kitchen. The dishwasher opened right into the fridge and with a standard fridge, it was impossible to walk across the kitchen if the dishwasher was open, and since the sink is on one side of the dishwasher and the pantry is on the other, it was a giant hassle. We knew we had to replace the fridge anyway (the one the previous owners had left was leaky and warped) and my mom suggested we go with a counter-depth fridge to make it less tight in the kitchen. This was a brilliant idea that would never have occurred to me (thank goodness for moms!) and for the past three years, I haven’t regretted that more shallow fridge for a moment. Except that with the fridge on top and the freezer on bottom, plus less depth, it meant that our freezer was always super full. Definitely too full to ever put our ice cream canister in to freeze. Which meant no homemade ice cream. For two and a half years we talked about buying a second freezer and then in January, Bart came home from a quick trip to Lowe’s with a deep freezer for our laundry room. And suddenly, behold, there was plenty of room for me to keep my ice cream canister in the freezer which meant homemade ice cream, any time I wanted it. It’s been a good six months. I first made this chocolate chip cookie cheesecake ice cream when we lived in North Carolina and it’s remained possibly the very best homemade ice cream I’ve ever made. I have a special fondness for cheesecake ice cream recipes because they are usually ice cream recipes without eggs. Generally I find homemade ice cream without eggs to have that unpleasant coat-your-tongue quality that comes from basically a straight mixture of cream and sugar, so I’m always dubious of ice cream recipe with no eggs. Of course, making a homemade ice cream recipe with eggs takes more time (since you have to get the whole mixture to a simmer and then cool it back down to ice cold), not to mention that you have a good chance at scrambling your eggs if you’re not very careful. I speak from sad experience there. But when there is cream cheese involved, that cream cheese takes the place of eggs, and voila! Amazing homemade ice cream without eggs. Of course, cheesecake of any kind, let alone cheesecake ice cream, is basically just a vehicle for toppings or fillings in my book. And there’s no better add-in than chocolate chip cookies. A chocolate chip cookie ice cream is good, but when you add it to cheesecake ice cream, the tang of the cheesecake contrasted with the chocolate chip cookies? SO DARN GOOD. You can use either homemade chocolate chip cookies (this is the best recipe ever, if I say so myself) or it’s super convenient to just buy store-bought dough too. 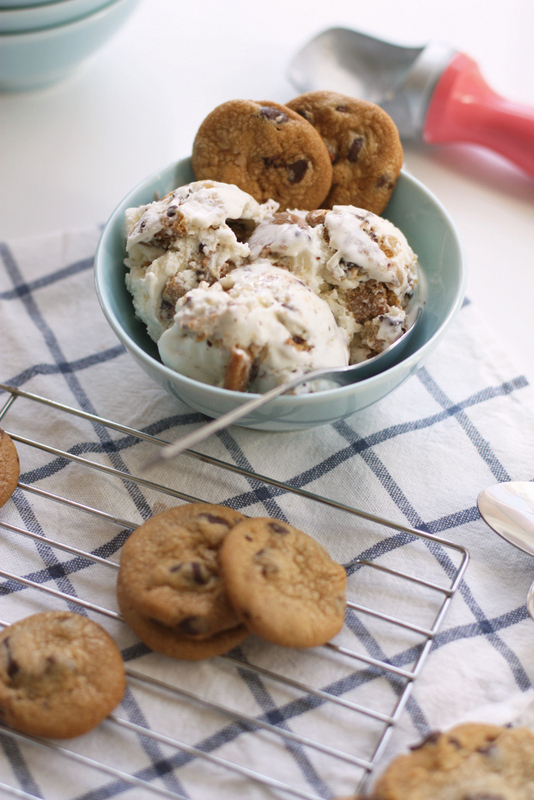 Either way, you’ll end up with an unbelievable bowl of chocolate chip cookie cheesecake ice cream. If you're looking for a simple cheesecake ice cream recipe, this one has only six ingredients, plus it's a recipe for homemade ice cream without eggs. 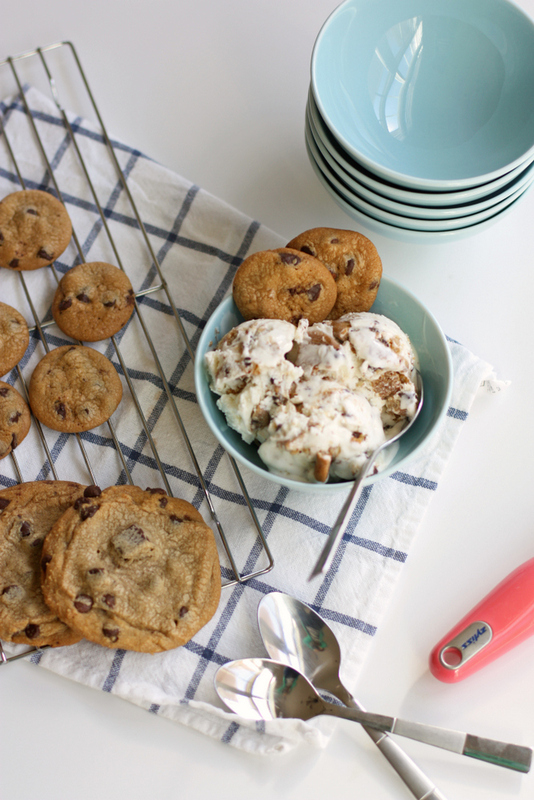 Chocolate chip cookie cheesecake ice cream is hard to beat, but you can make it your own with any add-ins you like! Combine all ingredients except cookies in a blender and process until smooth. Refrigerate until completely chilled. Pour into your ice cream maker and mix according to manufacturer's directions. Transfer to a covered container. 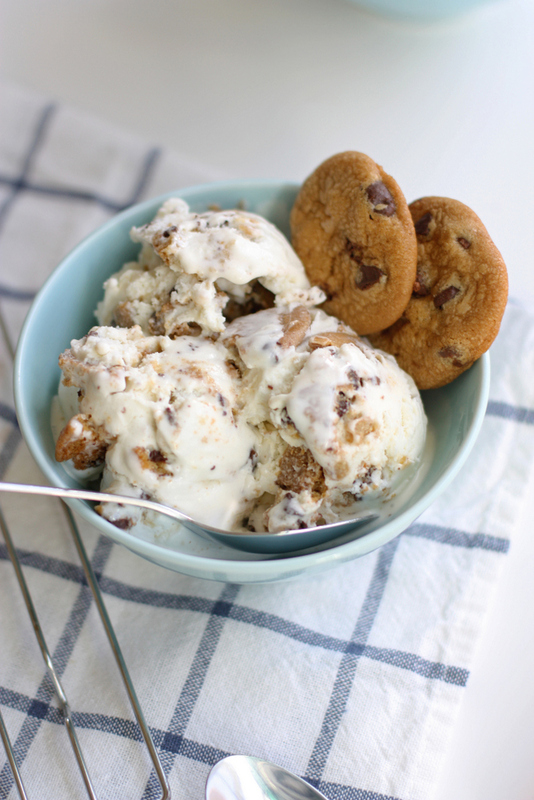 Break up the cookies into chunks (I like mine about the size of nickels and dimes) and fold into the ice cream. Freeze for a few hours until solid. You're speaking my language!! 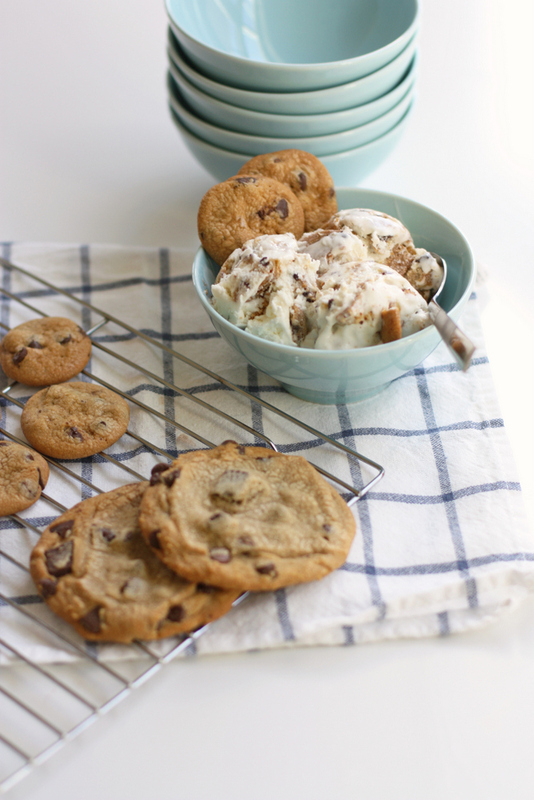 I could probably give up all things sweet if I could still have my ice cream and chocolate chip cookies. I'm definitely going to have to try this! I got an ice cream maker for Christmas so I'm always on the look out for a new and awesome recipe. Cheesecake ice cream is one of my favorites and I haven't tried making it. And with chocolate chip cookies added in? WOW! Have you shared how to make your own broth? Totally interested! For the cookies you add, would you recommend a soft cookie or a crispy cookie? Or does it matter? I think a soft one would taste more like cookie dough bits were added. It just depends on what you want! A softer one does taste more like cookie dough and a crispier one gives you more crunch. Or you could even do a combo! Have you found that having a freezer on the bottom causes your fridge to get colder? During the winter all of the produce in my fridge would freeze, no matter where in the fridge I put it. This kept happening to my mom too, and since we both have freezer-on-the-bottom refrigerators for the first time we thought this might be the cause. Weirdly this isn’t an issue during the summer, even though the interior of my house is about the same temperature year round. Hmm, I haven’t noticed that! I am 100% making this this summer! We got an ice cream maker as a surprise (non-registered) wedding gift and initially we didn’t use it much. But then the last 4ish summer I’ve easily made over 50 batches, probably much more. So much I killed the motor and was happy to buy a replacement a few weeks ago! Homemade ice cream is a freezer staple for us! Also, I don’t know how anyone lives without a deep freeze! Ours is almost constantly full! I already can’t imagine how we lived without it!